so, how is it going? have you been fun “stalking” your partner? have you figured out what you are making? I finally figured out what I am going to make, now I just have to figure out how to make it. ahem. guess I had better hustle. for sure. oh, it is fun, isn’t it? if you have any questions, please feel free to contact me or any of the co-hosts. and again, be sure to check out the tutorial links that Jill posted or this post from Clover & Violet if you need some ideas. and now for even more fun…remember, after your partner has received their gift you can blog about the gift you made and/or the gift you received for a chance to win prizes! myself and the other the co-hosts will host a linky party starting April 1, and each of us will randomly award one participant a prize. it’s TEN whole chances to win! 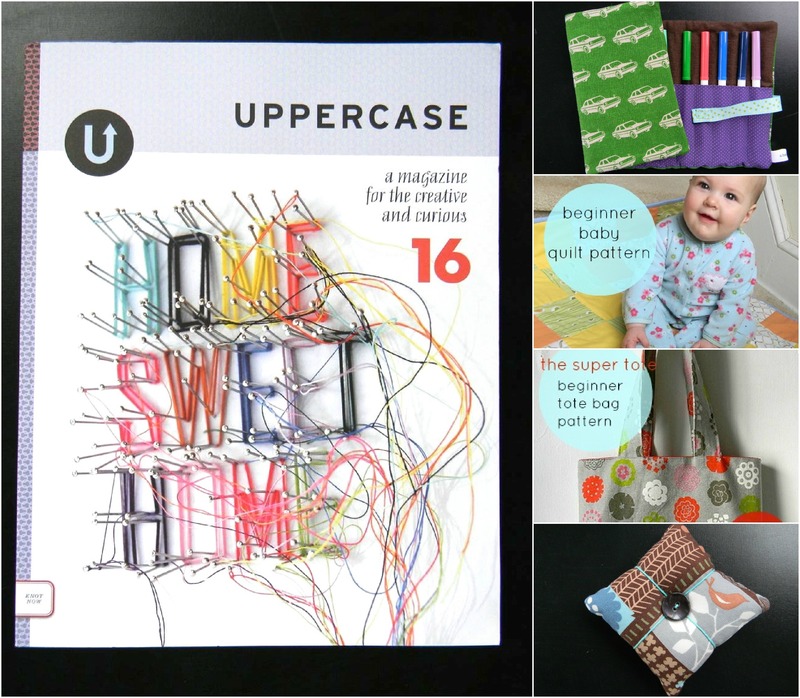 this includes 1) a copy of Uppercase Magazine, issue 16. it’s one of my favorite quirky and creative magazines, 2) a handmade traveling artist roll –an on-the-go set filled with a pad of paper and 10 markers for yourself or your little artist! 3) two of my best-selling, photo-rich patterns: the super tote and beginner quilting, and 4) a handmade pincushion. each of these items was carefully selected and tasked with the job of sparking as much creativity as possible! want to know the other nine prizes? head on over to each co-host’s blog to see what they are giving away! there is so much good stuff! and, don’t forget to poke around on the list of participants when you have a moment! there are an awful lot of new friends to be found on that list!